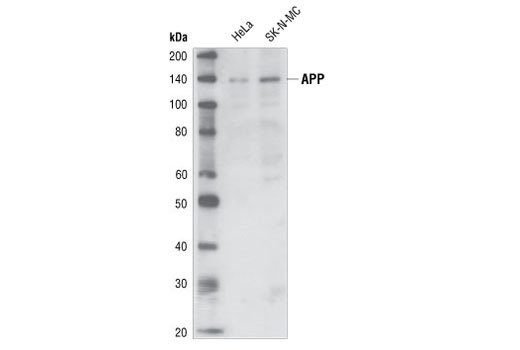 Western blot analysis of extracts from HeLa and SK-N-MC cells, using APP/beta-Amyloid (NAB228) Mouse mAb. 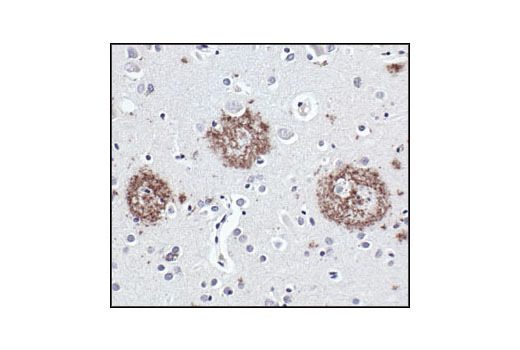 Immunohistochemical analysis of paraffin-embedded Alzheimer's brain, using APP/beta-Amyloid (NAB228) Mouse mAb. 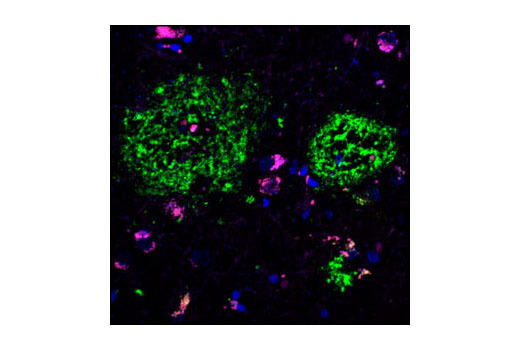 Confocal immunofluorescent analysis of paraffin-embedded human Alzheimer's brain using APP/β-Amyloid (NAB228) Mouse mAb (green) and Phospho-p44/42 MAPK (Thr202/Tyr204) (197G2) Rabbit mAb #4377 (red). Blue pseudocolor = DRAQ5™ (fluorescent DNA dye). Antigen Unmasking Citrate: 10 mM Sodium Citrate Buffer: To prepare 1 L add 2.94 g sodium citrate trisodium salt dihydrate (C6H5Na3O7•2H2O) to 1 L dH2O. Adjust pH to 6.0. To prepare 10 ml, add 30 µl Triton™ X-100 to 10 ml 1X PBS. Mix well then add 0.1 g BSA (#9998), mix. Wash three times in xylene for 5 min each. Wash two times in 100% ethanol for 10 min each. Wash two times in 95% ethanol for 10 min each. Antigen Unmasking: NOTE: Consult product datasheet or product webpage for specific recommendation for the unmasking solution. For Citrate: Bring slides to a boil in 10 mM sodium citrate buffer pH 6.0, then maintain at a sub-boiling temperature for 10 min. Cool slides on bench top for 30 min. APP/beta-Amyloid (NAB228) Mouse mAb detects endogenous levels of APP/beta-Amyloid protein. Although this antibody recognizes both the phospho and non-phospho forms of the protein, it has been shown to prefer the phosphorylated form in some systems. Monoclonal antibody is produced by immunizing animals with beta-amyloid and the epitope maps to the amino terminus of beta-amyloid (Lee et al., 2003).